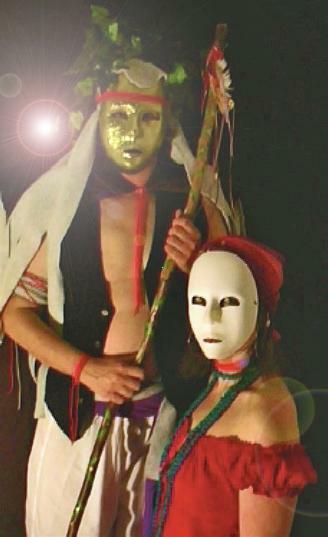 Above: Ritual Theatre performance with Patrick Jasper Lee and Annabel Martin-Lee. 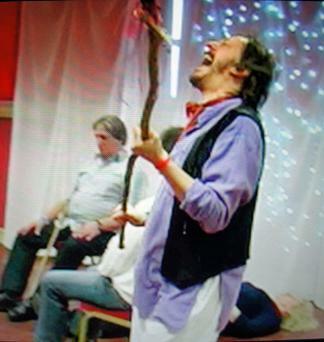 Right: A picture taken a few years ago of a Ritual Healing session at the Brighton Goddess Show, a Mind/Body/Spirit exhibition. During the session people who wanted healing with the Chovihano stepped up onto the stage and either lay or sat while the ritual was being performed, expressing the trauma and pain of the various individuals of the group. The man sitting on the left in the picture stood up to dance without his stick after the session finished, which he had never done before, at least not in many years! When nomadic tribal Gypsies of long ago practised a ritual, theatre was ordinarily at its heart. Absorbing the social, emotional and spiritual elements in any community was their task as they travelled from country to country, and more importantly from community to community. It is a community's spirit, or personality, which will separate it from another community; people collectively create a spirit, in modern times a nation, but in earlier times, a tribe. The spirit of the tribe still has a beating heart for many of us. The Gypsies' social neutrality, which caused them to be segregated from most communities they encountered, caused them to quickly understand the nature and heart of the people they were mixing with. A 'nuance' would thereafter stand out large as life. If you would like to book Jasper for a talk and demo of a Romani Ritual Soul-Recovery session please contact us. A chovihano is the Romani term for 'medicine man', 'witch doctor', 'wizard', in old lore; some have even interpreted it as 'shaman' in modern times, although Jasper doesn't favour the latter definition. The chovihano is concerned with the influence of otherworldly matters, psychic activity and sickness. Moreover, the chovihano is likely to be a counsellor in a psychological sense and concerned with the social and emotional welfare of members of his community. In these modern times, we tend to misunderstand what these real roles in communities were really all about.